Peter Bowman was born in Leeds in 1957. He attended Carlisle College of Art & Design in 1973 and Norwich School of Art in 1975 where he gained a BA Honours Degree in Graphic design & Illustration. He moved to London in 1978 after a short sabbatical in Italy. Inspired by this journey he found the world of freelance illustration beckoned. Peter first illustrated numerous Science Fiction Novels & Fantasy Book covers, successfully progressing into Advertising & Packaging illustration and on the way building an impressive client list. Bluechip companies such as Virgin Airways, Walt Disney, Pirelli, TSB, Upmann, Marks & Spencer and Sainsbury to name a few. Peter published the first of his 48 children's books in 1984. His books have been translated into 20 languages with over 200 editions worldwide and appeared on TV. His versitility in all book formats has helped him create projects for a variety of publishers - He has illustrated & written for the popular Children's Picture book, Pop-up and Novelty, Board book and Fiction book market. 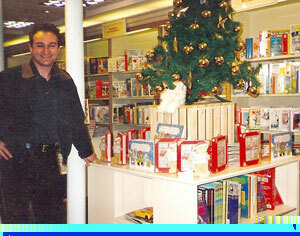 He has also designed and illustrated Greetings Cards, Calendars and Wrapping Paper. Having worked in London for over 15 years, Peter moved to Cheshire in the mid - nineties where he continues to work on new projects.